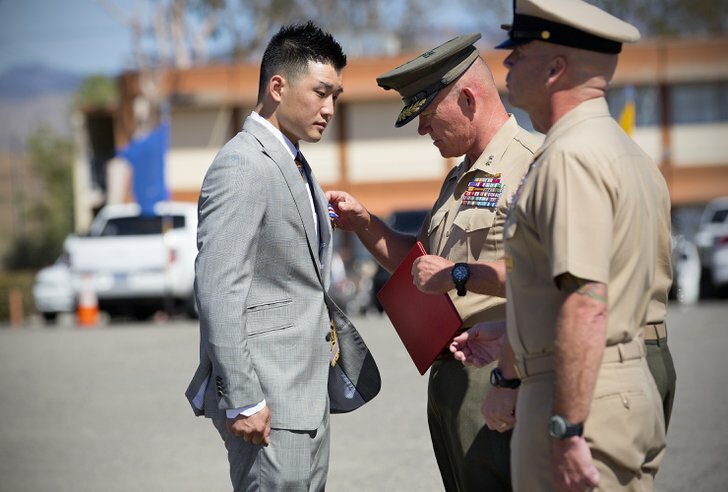 CAMP PENDLETON — When “Doc” Kong saw a Marine drop from a shot to the chest, he didn’t hesitate. 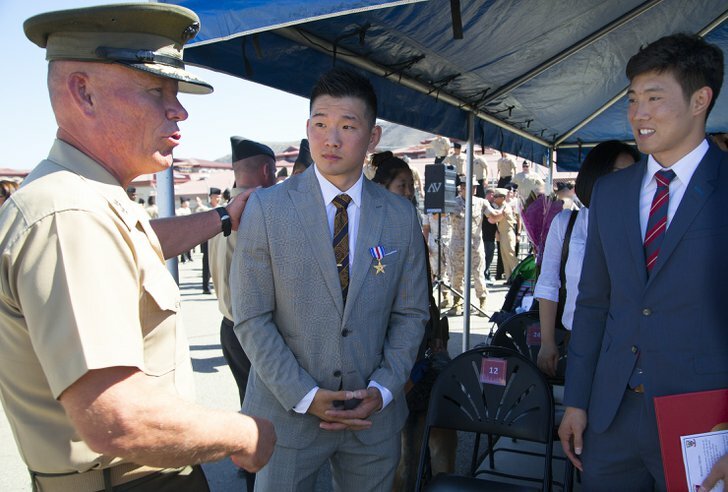 While shooting his rifle to suppress the enemy attack, Petty Officer 3rd Class Jonathan Kong rushed into the open under heavy machine gun fire to retrieve the Marine and administer life-saving medical care. The former Navy hospital corpsman “courageously fought through an enemy ambush to save the life of a wounded Marine,” on June 13, 2011 in Sangin, Afghanistan, the Marine Corps announced. 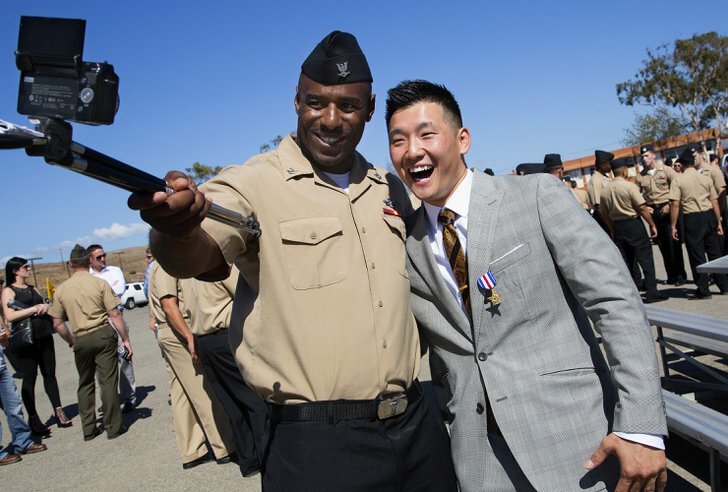 For his heroic achievement, Kong was awarded the Silver Star, the nation’s third-highest medal for valor in combat, during a ceremony Friday afternoon at Camp Pendleton. 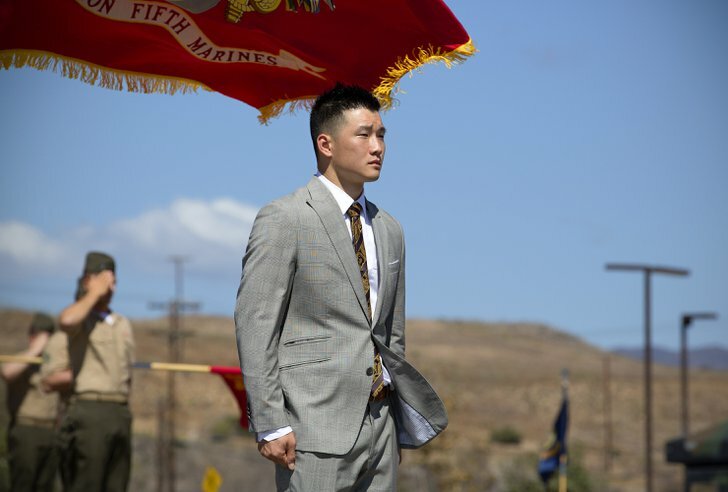 In brief remarks on the 5th Marine Regiment parade deck, Kong told guests he didn’t feel he deserved the award. 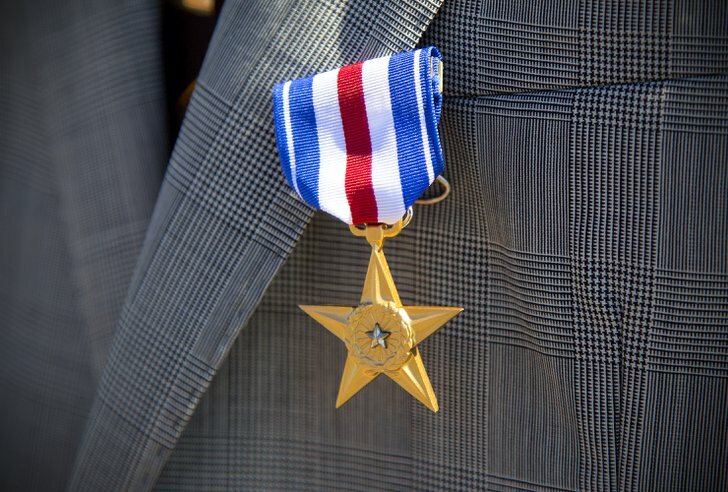 “Honestly, these other corpsmen out here… I was with them in Afghanistan and I know for a fact if they were in my shoes they would have done the same thing. If I was the one laying on my back, someone else would be dragging me behind the wall,” he said. Kong was serving with Company B, 1st Battalion, 5th Marine Regiment in Kotozay village that day. They were a few hours into a four-day clearing operation, patrolling with the assault element through a maze of mud-walled housing compounds, when Cpl. Michael Dawers fell to the ground. Rounds were striking all around the wounded Marine. Kong shot back but the onslaught was relentless. 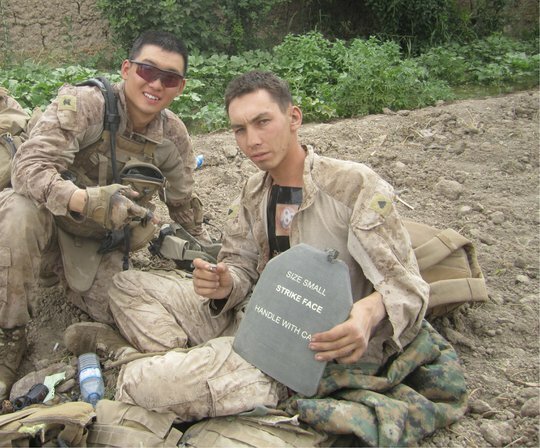 “As he observed enemy fire dangerously approaching the wounded Marine, Hospital Corpsman 3rd Class Kong courageously rushed from his covered position (and) boldly charged into the kill zone dodging a hail of bullets,” his citation says. “I just ran out,” Kong recalled after the ceremony. “When a Marine gets hit, you don’t really think. … You get so close you’re family,” so you have to help, he said. Kong was serving his second tour to Afghanistan, having deployed with a scout sniper platoon in 2009. He was experienced in providing medical care under fire. Usually the fear didn’t set in until after the shooting stopped, he said, when you had time to consider the worst. This time was different. About half-way to the casualty, Kong got scared. “It’s been a good ride. I’m probably going to die right now,” he remembered thinking. But he didn’t turn back or freeze. 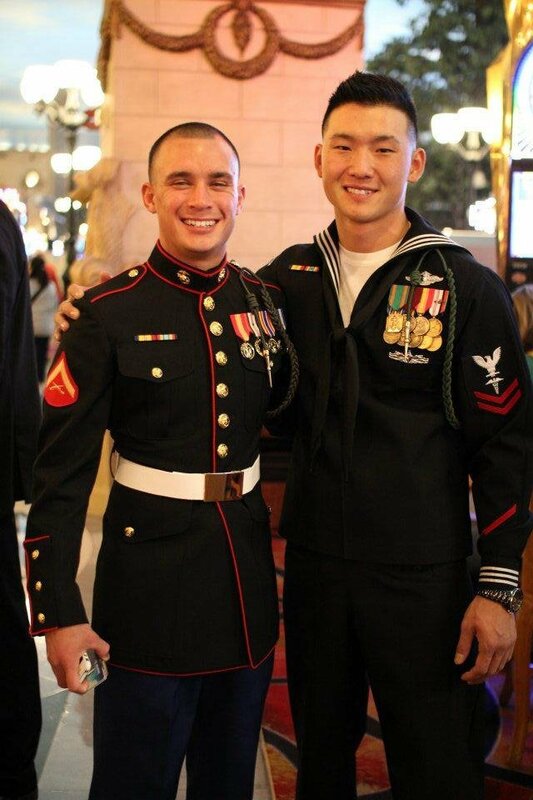 “You’re fine, you’re fine,” Kong said when he reached the wounded Marine. Dawers was writhing in pain. The bullet had nicked the top off his chest plate and shattered his sternum. Kong tried to drag the Marine and his heavy rucksack out of the mud. When that didn’t work he hunkered down and kept shooting until Dawers got his pack unfastened. Then Kong stood and pulled the wounded Marine 50 feet to cover. “Doc, you just saved my life,” Dawers said when Kong rolled him on his back to treat his wounds. 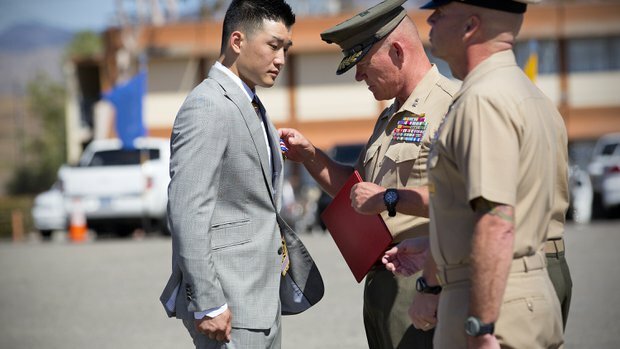 Maj. Gen. Lawrence Nicholson, commanding general of the 1st Marine Division and its 25,000-strong ground combat element, pinned the medal on Kong’s grey suit lapel. “There’s not a Marine or sailor here that can say they haven’t been scared under fire. But it’s what you do with that fear. It’s how you control that fear. It’s how you channel it, and how you react to it. That’s what separates guys like Doc Kong from the rest of us,” Nicholson said. “On that June morning, Doc Kong reacted instinctively … (He) saw that Marine laying there in great anguish and Doc Kong decided at that point that he had to get to his Marine. “It is humbling today for all of us to hear that citation, to know what you did in the face of enormous risk and peril to yourself,” the general said. Dawers recovered from his wounds and rejoined the battalion. After finishing his service in the Corps, he settled in Sacramento. 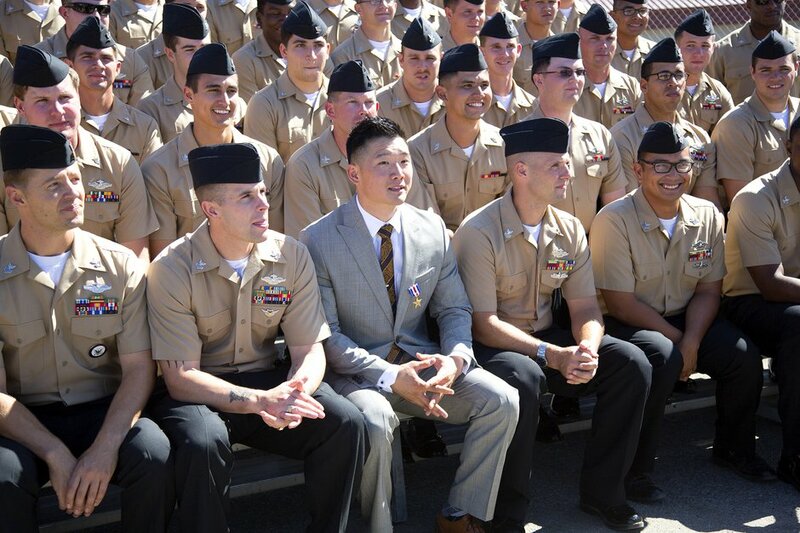 He finished his six-year Navy enlistment in 2013 and enrolled in school with plans to become an emergency room surgeon. Kong, 25, of Milpitas, studies at De Anza Community College and finished an intensive summer course in chemistry at Stanford University. In combat, Marines always asked: “Hey Doc, how do you stay so calm?” Kong didn’t feel calm treating Marines under fire. His mind was racing, but his hands were steady. Applying those skills as a civilian surgeon, “I think that’s something I can do,” Kong said. 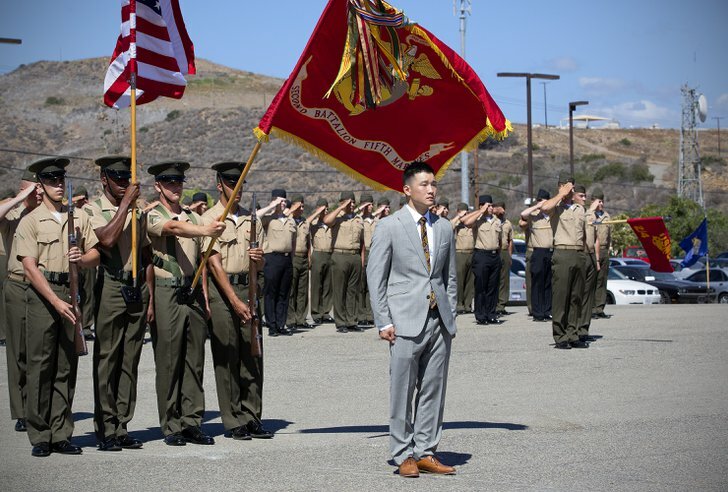 “By his zealous initiative, courageous actions, and exceptional dedication to duty, Hospital Corpsman 3rd Class Kong reflected great credit upon himself and upheld the highest traditions of the Marine Corps and the United States Naval Service,” his citation says. Kong has also been awarded the Navy Good Conduct Medal, Combat Action Ribbon and the Navy and Marine Corps Achievement Medal.